More than a decade after the collapse of central planning in most former communist countries and the disintegration of the USSR, Cuba remains an “island of socialism” in the Caribbean sea, 90 miles from the United States. All along, and in spite of massive economic difficulties, the survival, of “socialism“ has been the authorities’ explicit objective. So far they have achieved their goal through a combination of political determination, some good and some very bad economic policies, and a steep deterioration in the living standards of the Cuban population. This paper tries to explain the behavior of output and productivity in Cuba in the period since 1989, with particular emphasis on the role of macroeconomic and structural policies, and attempts to provide some basis for evaluating the outlook for the Cuban economy under alternative policy scenarios. • Reform and stabilization, 1994-96. In this phase, a new strategy is implemented that combines (i) macroeconomic stabilization (a sharp fall in the fiscal deficit though deep cuts in government expenditure including social spending and subsidies to enterprises, and an absolute decline in the money supply); and (ii) structural reforms (creation of basic cooperative units and free farmer’s markets in agriculture, legalization of self-employment and de-criminalization of the holding and use of U.S. dollars). Abruptly, output and labor productivity stopped falling in 1994 and recovered strongly in 1995-96. The fiscal deficit plunged, inflation vanished from both official and parallel markets, the monetary overhang shrank, and the peso appreciated in the unofficial market. • Backtracking and muddling through, 1997- 2001. The measures introduced in 1993-94 were clearly successful from an economic point of view. From the perspective of the government, however, they had created political problems. The incomes of the self-employed, some of the private farmers, and some in the tourist-related sector, including prostitutes, rose much faster than the wages of state employees, which had fallen dramatically in real terms during the early 1990s. In response, the government failed to pursue the reforms and even backtracked in some areas, for example by increasing the taxation of self-employment activities. Can these developments be explained? There is, in fact, not much of a mystery about the first phase. First, the elimination of Soviet subsidies on sugar and nickel imports from, and fuel exports to, Cuba was a massive negative terms-of-trade shock for both households and enterprises. Second, the end of Russian loans to Cuba and the corresponding fall in Cuba’s foreign saving led to a steep decline in domestic investment. Third, the collapse of trade arrangements with the CEMA disrupted Cuba’s foreign trade and curtailed supplies of materials and capital goods to domestic enterprises. These events prompted a bad policy response that led to increasing distortions, rationing, and a massive increase in the budget deficit. All the ingredients for a deep economic crisis appeared to be present. In a previous paper,2 hereafter referred to as “Mirage or Reality,” I considered three possible explanations for the economic recovery in the second phase: (a) that the recovery never took place and was a mere statistical fabrication; (b) that it reflected the keynesian effects of demand-side shocks; and (c) that it resulted from the macroeconomic and structural measures adopted in 1993-94. The paper concluded that there was little empirical support for the first two hypotheses, while the third one seemed to be consistent with the evidence. In particular, the slashing of subsidies to loss-making enterprises helped to bring down the deficit, the money supply, inflation in some sectors, and the monetary overhang in others. Private employment surged with the creation of agricultural markets and the self-employment sector, absorbing the workers released by troubled state enterprises and still allowing for a decline in unemployment. I will argue that continued growth in 1998-2001 reflected the lagged effects of reform and stabilization and could have been much higher had it not been for the lack of perseverance, and in some cases the backtracking on structural policies. Macroeconomic policy, so far, has remained appropriately cautious. 1. To estimate, on the basis of time-series/cross-section regressions, a sectoral model of the Cuban economy’s supply side. 2. To use the model to analyze the contribution of exogenous shocks and shifts in policy-related variables to changes in TFP and output during the past decade or so. These variables include the rationing of energy; the discount on the peso in the parallel foreign exchange market; the subsidization of loss-making enterprises; and the share of growth of non-state employment. 3. To perform model simulations of the possible evolution of potential GDP on the basis of alternative assumptions about economic policy. These objectives require a substantial increase in the number of observations in comparison with that used in the earlier paper. To that effect, this paper relies on the data for nominal and real GDP, average monthly wages and employment broken down by productive sectors. This data is provided in the Anuario Estadístico de Cuba, 20004 for the period 1994-2000. Estimates of GDP deflators by sector can be obtained by dividing nominal GDP by the corresponding constant 1981 price series. The data can be backdated to 1985 (for GDP and price deflators) and to 1989 (for employment and wages) on the basis of the Economic Commission for Latin America’s La economía cubana: Reformas estructurales y desempeño en los noventa (CEPAL 2000). 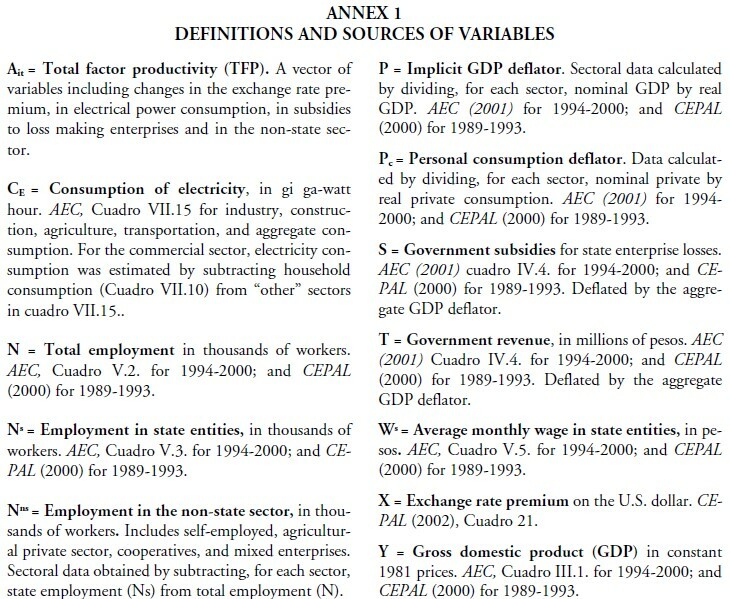 More complete definitions and sources of data are provided in Annex 1. To sum up, a complete set of output, employment, and price-wage data is available from 1989 to 2000 (12 years). With seven sectors, this yields a total of 84 observations. 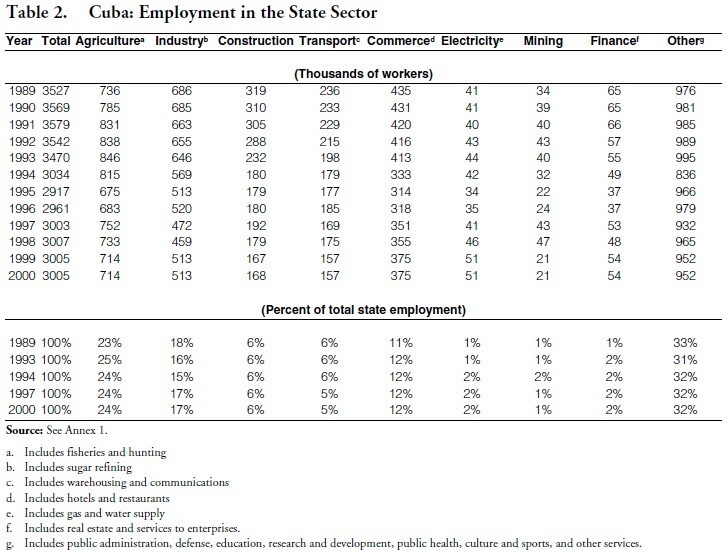 The relatively small “financial institutions” sector and the large and heterogeneous “others” sector5 were excluded from the regressions for two reasons: (i) production data in those sectors is probably based on scaled up input data and not on measures of physical output; and (ii) the discontinuity beginning in 1994 between CEPAL and official Cuban statistics is particularly large for those sectors. Still, the use of sectoral, as opposed to economywide, data allows for a large increase in degrees of freedom. 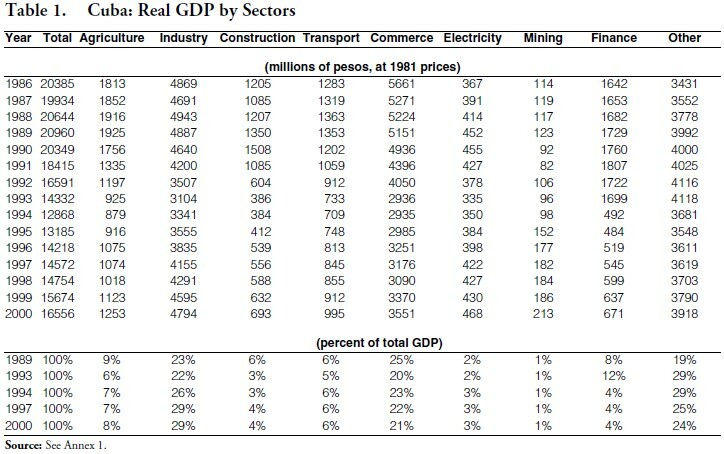 • As shown in Table 1, total GDP, as well as GDP in most sectors, peaks in the late 1980s (agriculture, transportation, industry and total GDP) or in 1990 (construction and electricity). 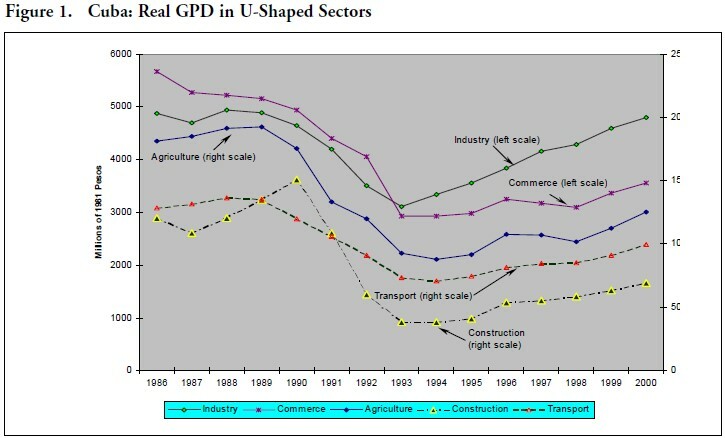 Output then contracts in all these sectors and reaches a trough in 1993 (industry and electricity) or in 1994 (agriculture, construction, aggregate GDP). The commercial sector, where output had started to decline already in 1986, also bottomed out in 1994. All these sectors recovered strongly in the next few years and stabilized in the late 1990s. The pronounced u-shaped pattern of output in most sectors is illustrated in Figure 1. • Employment is a lagged indicator of economic activity. In most key sectors (industry, construction, transportation and commerce) state employment begins to fall in 1989 and continues to decline beyond the trough in GDP (Table 2). State sector employment finally bottoms out in 1995 (in construction and transportation) or in 1996 (agriculture and commerce). Industrial employment reaches its trough later, in 1998. 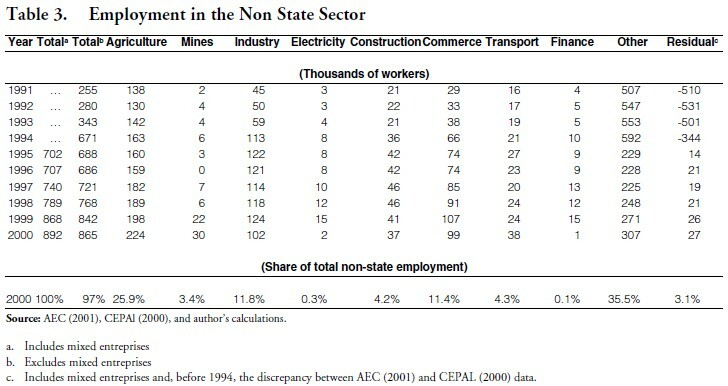 • Employment in the non-state sector is very small until 1993. It surges in 1994-96 and then stabilizes at around 25% of total employment (Table 3). • Average real wages6 in the state sector drop continuously from 1991 to 1995 (by more than one half in industry, construction and commerce) and rise slowly thereafter. • The rate of inflation (based on the GDP deflator) increases rapidly in 1993 and 1994, falls by about half in 1995 and remains very low, or negative, thereafter. Sectoral prices rise sharply from 1992 to 1995, particularly in industry and agriculture) and stabilize thereafter. The exception is electricity and gas where prices are kept stable through rationing. Unofficial indexes of free and black market prices show a much sharper acceleration in 1993-94 and a steep decline thereafter. The model seeks to explain the supply side of the economy by combining three equations for each sector: a production function, a labor supply function, and a demand for labor function. The labor supply function expresses employment in the state sector as a log-linear function of the real wage (w-pc)—the nominal wage rate divided by the consumption deflator—and n* the average worker’s maximum daily work capacity times the potential labor force. The parameter θ represents the relative preference of workers for consumption over leisure. The demand for labor reflects maximization of enterprise profits subject to the constraint imposed by the production function (1), which implies the equality of the marginal productivity of labor and the real wage rate (wi-pi) where pi is the GDP deflator for sector i. Combining equations (3) and (4) and substituting into the production function (2) gives the aggregate supply function for each productive sector. where αθ = β/(1+β), and ν i is a sector-specific constant. Equation (5) provides the general form of the estimated equations presented in Table 4. Before moving to the measurement of factor inputs and TFP, there are a number of data issues that must be confronted. First, there is a significant discontinuity in the employment and national accounts data derived from CEPAL (for 1989-1993) and those taken from the AEC (for 1994-2000). To deal with this problem, the regressions include a dummy variable (d) equal to one from 1994 to 2000 and to zero otherwise. It is used in the equations reported in Table 4, both in additive form, and multiplied by the state employment and relative price variable. This is not an ideal solution, however, because the dummies could be picking up effects other than the statistical discontinuity. In particular, since 1994 was the first full year of reform, the dummy variables could be capturing the effects on TFP and GDP growth of omitted structural change variables, including the emphasis on state enterprise profitability after 1994. Measurement of the non-state sector. It would have been desirable to explain separately output in the state and non-state (private and cooperative) sectors. Unfortunately, real GDP data by type of ownership are available only for the overall economy. It is possible, however, to obtain employment data disaggregated both by type of production and by ownership (see Annex 1). On this basis, a variable was constructed7 and used in the regressions to take some account of the rapid rise in the non-state sector after the measure taken in 1993-94. The coefficient of this variable is positive as expected (total output increases when the share of the more productive non-state employment rises) and consistently significant. Employment in state enterprises. Ideally, the variable n should represent the effective labor input defined as the number of employed adjusted for the average number of hours worked and the effort supplied by the average worker. This is important in Cuba, as it was in other communist countries in the past. Because of the government’s reluctance to create open unemployment, state enterprises tend to react to a fall in demand not by firing workers but by cutting real wages, to which workers react by lowering the number of hours worked (through absenteeism, goofing off, or giving up second jobs). Unfortunately, data for hours worked, overtime, and shifts, is not available in Cuba, and data for work effort does not exist. Thus, a key aspect of the cyclical behavior of labor markets cannot be analyzed. Relative prices. The most disturbing result stemming from Table 4 is the negative (and strangely significant) value of the coefficients for the relative price variable in 1989-93. For 1994-2000, the coefficient is positive and ranges from 0.08 to 0.23, not way out of line with the coefficients of the state employment variable. But there is no reason why the estimate for the previous period should have a negative sign. It could be that the labor market equations are misspecified, for reasons suggested earlier, that the dummy variables are messing up the results, and/or that the true underlying production function is not Cobb-Douglas. Capital stock. While aggregate investment data is available for the whole economy from 1989 on, investment by sector is available only from 1994. These data were used to build sectoral capital stock variables that in turn were used to estimate supply functions for the seven sectors for the shortened period 1994- 2000. However, the estimated coefficients of the capital stock variables were statistically insignificant. This is probably because the data are not good (among other things, data for individual sectors do not differentiate between business fixed investment, residential construction, and inventory accumulation. Real government subsidies (st). The specific variable used here is the real value of government subsidies provided to loss-making enterprises. The role of this variable is not to capture the direct effects of these subsidies on state enterprise production (subsidies for losses, just as taxes on profits, do not affect the firm’s profit maximization plan) but rather to capture the general effects of soft-budget constraints on overall enterprise productivity. In effect, these subsidies keep unprofitable enterprises alive, thus absorbing scarce resources that could otherwise be used more efficiently by other (state or non-state) enterprises. They also convey to firms in general the message that enterprise managers need not work hard to cut losses by increasing productivity, because in any event they will be bailed out at the expense of the budget. 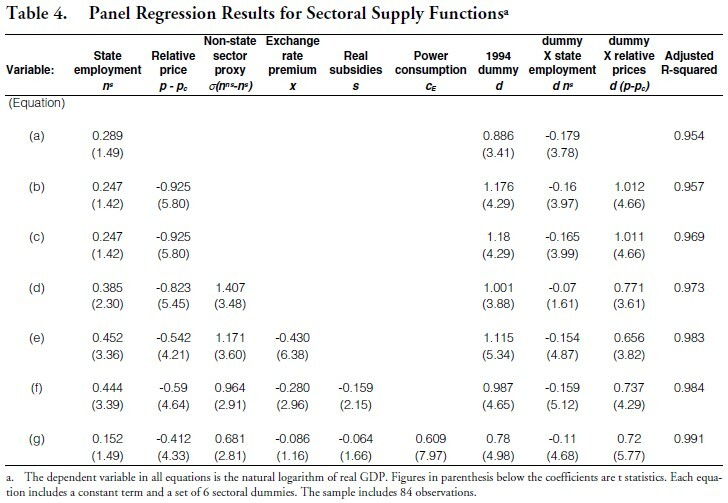 The estimated coefficient of subsidies is thus expected to be negative, and this is confirmed by the results in Table 4, even though significance drops in equation (f), probably because of multicollinearity. Electricity consumption in real terms (cE t). In the late 1980s the Soviet Union suspended shipments of heavily subsidized oil to Cuba in exchange for sugar11 Forced to satisfy its oil requirements (which accounted for the bulk of its energy use) by buying in the world market at market prices, and given the critical shortage of foreign exchange it was experiencing, the Cuban government decided to ration energy supplies to both households and enterprises. For the latter, the result was a massive adverse technological shock that resulted in generalized output cuts. As expected, the coefficient of the variable cE t in Table 4 is positive, meaning that a decrease in the oil quota assigned to a particular sector or enterprise results in a contraction of output. CAN WE EXPLAIN THE 1990s? • The period of contraction (1989-93) associated with the end of Soviet aid and characterized by a steep fall in output. • The period of recovery (1994-96), following the stabilization and liberalization measures adopted in 1993-94. • The period of “muddling through” (1997-2000) characterized by the cessation of further structural reforms (and even the backtracking in some areas), but with continued emphasis on macroeconomic stability. In the period of contraction, the fall in domestic production averaged 10 % a year and reflected a steep decline in total factor productivity. More than half of this decline was accounted for by the rationing of power supply following the end of Soviet subsidies. The other part resulted from a bad policy response that increased distortions (as evidenced by the widening of the exchange rate premium) and weakened incentives for enterprise reform (as reflected in a rise in subsidies). Capital and labor made no contribution to the change in GDP during that period. In the period of recovery (1994-96) positive growth was restored in spite of a decline in net capital formation. TFP surged at an annual rate of 10 percentage points following a broad improvement in policies. First, much of the sharp decline in the government deficit during that period resulted from a cutback in subsidies to cover enterprise losses, which tightened budget constraints and improved incentives in the state sector. Second, the exchange rate premium narrowed substantially following the legalization of the U.S. dollar, some price decontrol, and the reduction in monetary financing due to a sharply reduced government deficit. This contributed 2 percentage points to the growth of output in 1994-96. Third, the rise in the non-state sector following the measures taken in 1993-94 also contributed 2 percentage points to the average growth rate of real GDP during the recovery. Altogether, these three policy variables contributed seven percentage points to annual GDP growth, with most of the increase concentrated in 1994. Finally, the supply of electric power rose owing to an increase in both imports and domestic production of oil.12 It should be noted that the model overpredicts real GDP growth in 1994-96, as the identified policy variables are more than sufficient to account for growth in that period. The post reform recovery was a reality, not a mirage. From 1998 to 2001 real GDP expanded at an average annual rate of 5 %.13 This is not bad by the standards of developing countries in general (4.6% during that period) and much better than the average for Latin American countries (1.8%). The expansion was more than accounted for by continued growth in TFP and reflected a further increase in the supply of energy and additional reductions in government subsidies. However, the contribution of capital formation was negative, as it had been since 1992. The key question in these circumstances is: can the expansion of potential GDP be sustained? Of course, there is plenty of scope for TFP to grow at a fast pace. But this would require price and exchange system liberalization and, most critically, privatization. There is still some scope for reducing subsidies—not those to cover enterprises losses, but those to finance differentials between free market and regulated prices. However, a further increase in the supply of energy will depend on the vagaries of the world oil price (and of subsidized Venezuelan shipments), as domestic oil production appears to have tapered off. The recovery that started in 1994 is running out of space. The structural reforms that fueled the recovery in its early years have been essentially interrupted, capital formation continues to shrink, and the benefits from macroeconomic stabilization have been largely absorbed. Therefore, barring new structural change, further positive growth of actual GDP, stemming for example from a rise in tourist receipts or a policy-induced expansion of domestic demand, would soon bump against the constraint of a falling potential output. The result could be a resumption of inflation in free and black markets and the temptation to tighten price controls. More likely, as has already happened since 2001, it will take the form of a rise in the demand for imports. Given the lack of official international reserves and the authorities’ insistence on maintaining the fixed official exchange rate at par with the dollar, this would manifest itself in two ways: the further tightening of import controls; and the depreciation of the peso in the parallel market. The simulation results shown in columns (d) and (e) in Table 5 suggest what might happen over the medium- term (around three years) under two very different policy assumptions. Column (e) illustrates the case of unchanged policies: real GDP would decline at an annual rate of 2% even though the negative contribution of investment would stop, as the exchange rate premium on the dollar would likely widen with the tightening of import and price controls. The energy situation is assumed to remain unchanged although, of course, this would remain an area of vulnerability. Furthermore, any decline in remittances from Cubans abroad would compromise the authorities’ already difficult task of repaying its foreign obligations. More generally, the bleak prospects for national income raises questions about the government’s ability to fund its domestic and foreign liabilities, including the payment of pensions to an ageing population. The consequences of a shift in policy towards reform are illustrated in column (d) of Table 5. In this scenario, real GDP would grow at an average annual rate of 10 percent.14 TFP would surge and the contribution of capital formation would turn positive. The non-state sector would expand from 25% to 40% (measured in terms of the sector’s share in total employment), still well below the shares already achieved by many transition countries from China and Vietnam to Hungary and Poland. Exchange rate unification and the elimination of government subsidies would make a further contribution to the growth of TFP and output. In spite of significant problems with the availability and consistency of data, the empirical results presented in this paper seem strong enough to support some important conclusions. • Economic policies matter a great deal. • The cessation of Soviet aid coupled with a terrible policy response sent the economy into a tailspin in the first half of the 1990s. • The liberalization and stabilization plan of 1993- 94 brought about the resumption of positive growth. The recovery was real—not a statistical trick. • The Cuban economy is approaching the crossroads. Without new supply-side measures, continued recovery is likely to be thwarted as the gap between potential and actual GDP continues to narrow. Never has the policy choice been so clear: continued policies mean, at best, stagnation and debt services difficulties. Further backtracking on structural reforms would be a recipe for disaster, particularly if macroeconomic stability is given up. By contrast, a decisive reform plan would reinvigorate the Cuban economy and set the stage for a lasting improvement in the living standards of the population, after so many years of economic deprivation. 1. This period is curiously referred to by the Cuban officials as the “special period” (período especial). 3. The study relied mostly on annual aggregate GDP, saving, investment, and monetary/fiscal data from 1989 to 1998 for a total of only 10 annual observations. 4. Referred to hereafter as AEC (2001). 5. This sector, officially labeled “social, communal and personal services,” includes education, public health, R&D expenditure, and military and security spending. 6. Based on the GDP deflator. 7. This variable is the difference between the logarithms of non-state and state employment (nns–ns) multiplied by the share of nonstate employment into total employment (σ = Nns/N). 8. In reviewing possible explanations for this high value of the estimated labor coefficient, Berrnake and Parkinson (1991) suggest three possibilities: a bias due to technological shocks, a bias due to labor hoarding, and the effect of increasing returns. The first two explanations are relevant to the Cuban case (the Soviet oil shock of the late 1980s /early 1990s, and the tendency for labor hoarding by state enterprises). Yet the estimated values of α derived from Table 4 seems very low. 9. The subscript t indicates that the exchange premium changes over time but is the same for all productive sectors. 10. Every sector of the economy confronts the same exchange rate premium, so that the sectoral index i can be omitted. The same holds for government subsidies, in this case because data by sector is not available. 11. As well as the additional supplies of oil that Cuba could sell in the open market to obtain foreign exchange. 12. From 1989 to 1993 imports of petroleum and products fell by more than 60% from 13.1 million metric tons (mt) to 5.5 million mt while the rise in domestic oil production was small. As a result, total supply of petroleum and products fell from 13.8 to 6.6 milllion mt. By contrast, from 1993 to 2001 total supply increased by 35% (to 8.9 million mt) as both imports and domestic production rose. 13. This period includes an out-of-sample year (2001) in which the model over-estimated growth by just under one percentage point. Perhaps this is because the economy was affected by two exogenous shocks in that year: hurricane Michelle, and the effects on Cuba’s tourism of the events of September 11. 14. A formidable performance by revolutionary Cuban standards, but not greatly out of line with recent growth in developing Asia (around 6% at annual rate) and among the transition countries of the former Soviet Union (an average of more than 7% in 2000- 2001).